Showcasing a pure, elegantly-crafted design that comes from the finest aluminum and copper materials, the Cooljag Falcon-4 CPU Cooler offers some of the most advanced technology this industry has to offer. Boasting heatpipes positioned at an 30° angle, SkiveTek Technology, and 3 types of ultra-thin fins, you can expect levels of optimum performance you may have never experience before. The 120mm fan is PWM controlled, with a speed that can vary between 900 and 2500 RPM. This innovative technology creates an ultra thin noise-output that produces a barely audible 15 dBA that can range up to 24 dBA (which is still ridiculously quiet). 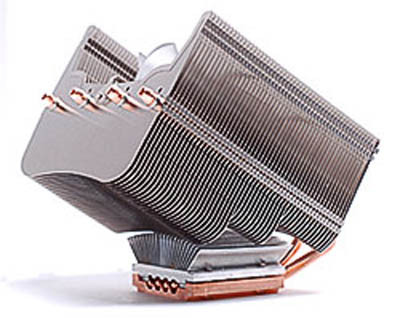 To create a perfect air flow over the motherboard, the fan, the fins, and the heatpipes are positioned at a 30° angle.